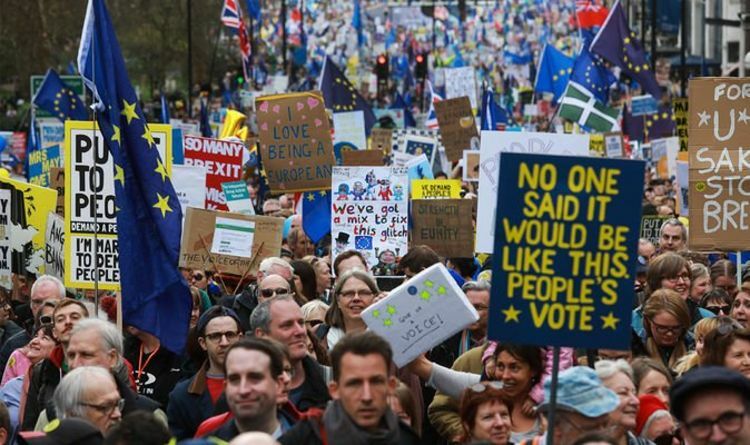 It was claimed by the People’s Vote movement that one million people protested in London, asking for a second Brexit referendum on March 23. The figure was then repeated by numerous news outlets. However, the claim was fact-checked by experts who claim the number was most likely between 312,000 and 400,000 people, according to Full Fact. The fact-checking website said it is hard to precisely measure crowd sizes at non-ticketed events, but it was “almost certainly” not one million. The crowd estimation technique used is known as the Jacobs method. It is done by dividing the crowd site area into sections, measuring the size of each section and then multiplying each area by the estimated density of people within that subsection. The organisers said they came up with the one million estimate using information from staff and volunteers, as well as examining aerial pictures from helicopters. They said that “peak crowd densities were estimated at 4.5 people per square metre”. Professor Still meanwhile claims the average crowd has between two and four people per square metre and anything more than four per square metre becomes too uncomfortable to move. However, even if this density of 4.5 people per square metre was the case throughout the whole march site of around 160,000 square metres, this would only account for 700,000 people. Moreover, helicopter footage allegedly showed there were areas where the crowd was much less dense than 4.5 people per square metre. There were also rumours on social media that the Metropolitan Police estimated two million people were in attendance at the march on Saturday. However, the Metropolitan Police told Full Fact: “We do not confirm crowd figures for marches or protests. Avengers: Which THREE Marvel films follow Avengers 4 and Spider-Man Far From Home in 2020?